This is not a typical ghost story. Usually ghosts are either scary, freaky or out to cause mayhem. In Pokergeist this particular ghost wants a bracelet. Not just any old bracelet. No, this one is the ultimate poker prize, the dream all poker players strive to reach. Such is the draw, not even death can stop a determined poker player. Clutch has a second chance to win, even if he has to use the hands and body of Telly, the hapless hero. At least, that’s the basic gist of the story but it’s not the whole story, not by a long shot and that is why this novel was so interesting. Telly is the epitome of the man who dreams big, who thinks he has what it takes to play with the big guys, but when he joins them, he gets a rude wake-up call. It’s very disheartening and the author made it very clear that the hero is at the tipping point. He’s not so addicted that he can’t stop, but he’s not far off. It’s the love of his life, Gretchen, that’s his anchor. But can he really stop gambling? Their relationship bears the strain of his dream and it’s very gripping, gritty and true-to-life. When you love someone, you want to help them, support them and encourage their hopes and ideas and Gretchen does that the best she knows how. Sometimes, there’s a breaking point and the author explored that a little bit. Telly’s dream comes close, very close to destroying one of the best things in his life, his relationship with Gretchen. The major complication comes from Clutch, the ghost. Clutch’s influence is a good thing/bad thing. There are times I cheered and others I thought he was a jerk – which is sort of how he was in life. Because he dealt with loan sharks, Clutch qualified for the ‘j’ word. It wasn’t just the fact that he owed money, it was who they went after to recoup their ‘investment’. I wonder if people ever think about that – that loan sharks don’t accept death as a reason to bring the balance sheet to zero. That messed up the subplot rather nicely. The subplot was about the people Clutch left behind and the author interwove their lives with Telly and Gretchen seamlessly. As the reader approaches the final few chapters, the author starts bringing all the players in this drama onstage for the big finale. I am happy to share that I ended up being stunned. The ending did not happen as I expected. What did happen ended up being a very savvy, clever and surprisingly funny wrap up. The angel that kept trying to get Clutch to ‘cross over’ finally got his way, but again, the why and how was greatly amusing, and yet, there was a lesson to learn, a moral to the story that was really sweet and poignant. The final showdown with Ant and Telly was a class act. The epilogue was perfect and sweet with a hint of that ol’ Clutch sass. 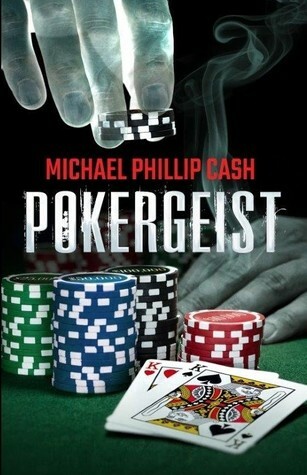 Pokergeist is a ghost story with depth, heart and grit. It follows a man who is basically good, timid and smart but loves poker and believes it’s the path to better things, mixed with a ghost who sees a second chance at that coveted bracelet and pursues it with a single minded purpose, and complicated by the love of a good woman who is wondering if Telly is still the man she fell in love with. Woven throughout this book is the story of real people in all their vices, darkness and passions. What redeems them are the good deeds, the integrity and the true love of Telly and Gretchen. This isn’t a fluffy book; it has teeth and it’s meaty, and it’s well worth spending time with.